NFL Analysis: Should Teams Pass or Rush When Backed Up Against Own Goal Line? It&apos;s a common practice in the NFL that when your team is backed up against your own goal line, you run the ball to "give some breathing room." Often you&apos;ll see either a QB sneak or a handoff right up the middle. In fact, since 2000, teams have run the ball on 1st down from inside their own 3-yard line on 72.4% of all occasions. We know that passing is the much more efficient option in today&apos;s NFL, so should teams actually be running the ball, using up one of their precious downs? A quarterback still has around 10 yards to work with when backed up against his own goal line, whereas a running back needs to ensure positive yardage -- plus he starts 5-7 yards behind the line-of-scrimmage on most occasions. 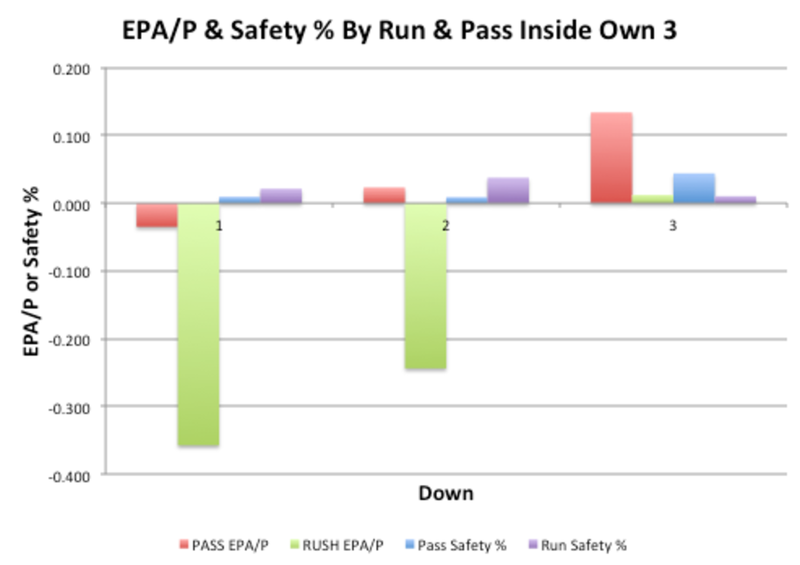 We&apos;re going to look at the track record in the league on passing and rushing plays using both EPA per play and safety percentage (% of plays on which a safety was recorded). As mentioned, teams run the ball 72.4% of the time on 1st down. On 2nd down, it&apos;s a lot closer to even where the rushing rate is 56.4%. 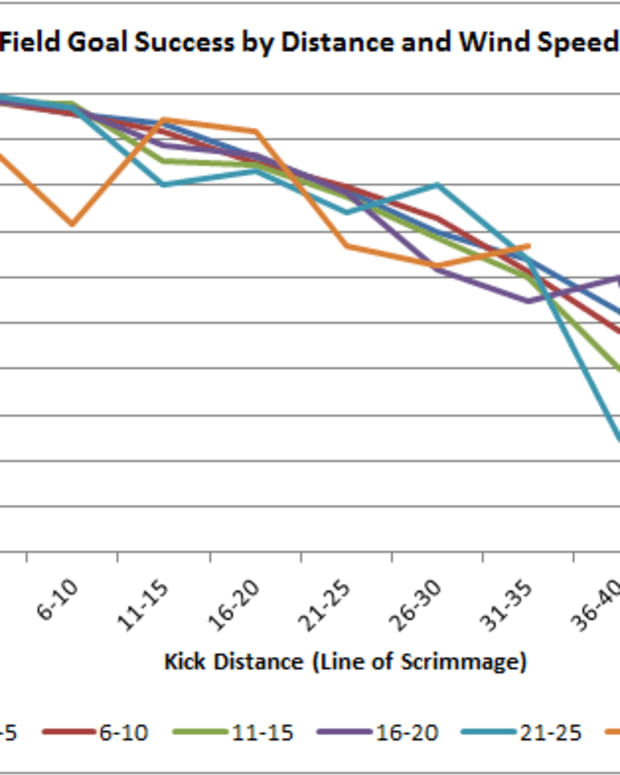 And on 3rd down, as expected, passing becomes the obligatory option, where teams run the ball only 34.8% of the time. Looking at efficiency, rushing efficiency goes from -0.36 EPA/P on 1st down to -0.24 on 2nd down and settles at 0.012 on third down. This could be due to a selection bias where teams are in more appropriate rushing situations on third down when they actually rush the ball. Passing, on the other hand, goes from -0.04 on 1st down to 0.02 on 2nd down to a respectable 0.13 on 3rd down. In other words, passing is the more efficient option on every single down. Similarly, pass safety percentage is significantly lower on 1st and 2nd down than run safety percentage. most passing safeties come on either penalties (often holding) or on a sack. On 3rd down, however, there is a steep increase in pass safety percentage. Teams are especially desperate on 3rd down, and in truth, taking a safety is not the worst case scenario in that situation. In fact, Bill Belichick is known for purposely taking a safety. Rather than punting and likely giving your opponent great starting field position, taking a safety is worth only 2 points -- not extremely significant in the high-flying touchdown league that is the NFL. One thing to note is that you cannot tell from play-by-play exactly how close a team is to their own end zone. In the game, there is a large difference between having the ball on your 1-inch line versus having the ball on the 1-yard-and-1-inch line. The numbers reveal, however, that like most situations, passing is the superior option. 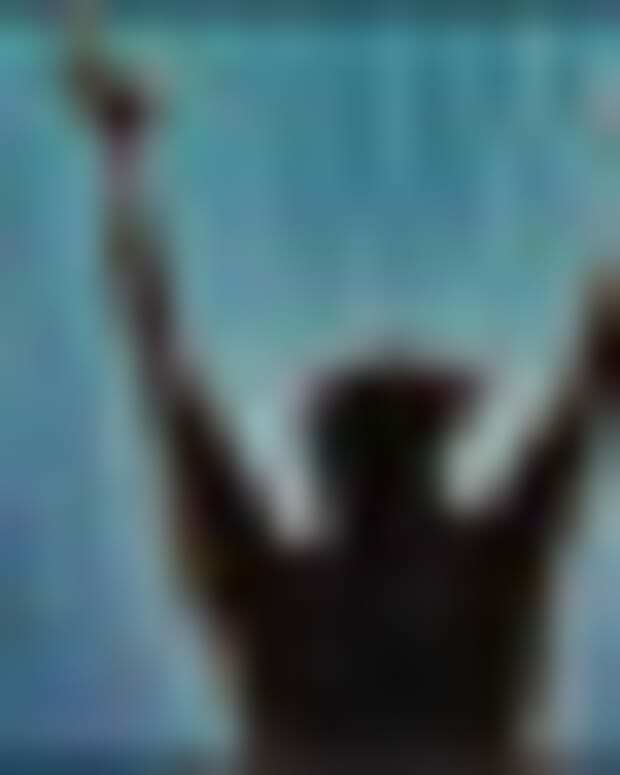 Who knows, you could even score a touchdown. Get more great NFL analysis over at Advanced NFL Stats. NFL Analysis: Broncos to Focus More Rushing, Defense?